Volunteers remove invasive species, help National Park Service staff address backlogged maintenance. [WASHINGTON, DC] Over 200 volunteers gathered at LBJ Memorial Grove in Washington, DC on Friday, June 15 to participate in a park maintenance project as part of The Corps Network’s 5th Annual Great Outdoors Day of Service. 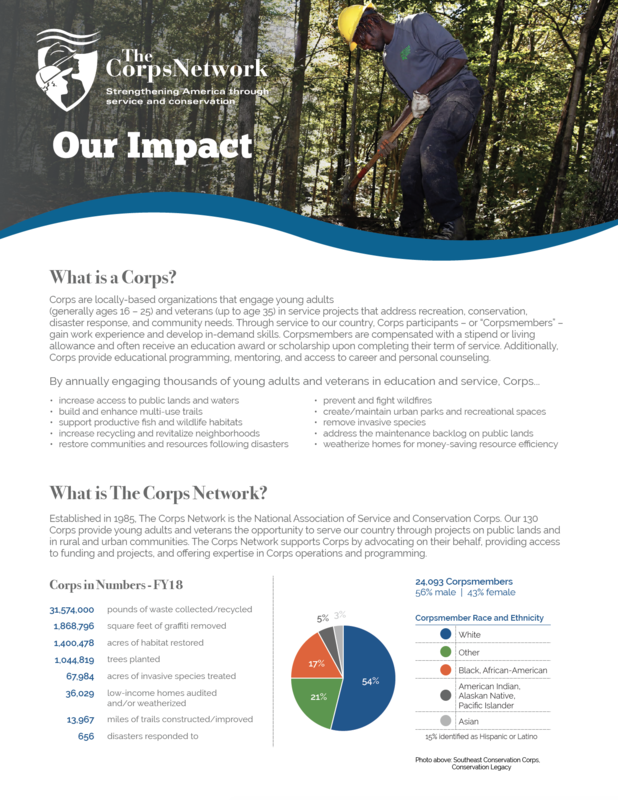 Among the volunteers were more than 100 AmeriCorps members and other service members from Conservation Corps in the Mid-Atlantic and South. Throughout the morning and afternoon, participants removed thousands of pounds of invasive trees and ivy that threatened the integrity of the park’s natural habitats. The Corps Network Great Outdoors Day of Service is an official event of Great Outdoors Month™, a presidentially-proclaimed month-long celebration of outdoor recreation and America’s natural spaces. Many outdoor activities promoted during Great Outdoors Month – including hiking, boating, and fishing – would not be possible without proper stewardship of park resources. Every year, the Day of Service engages volunteers in hands-on park maintenance in the nation’s capital and raises awareness about ongoing ways people can participate in volunteer or national service programs that help improve public lands. The Day of Service began with a kick-off event that included remarks from prominent figures in resource management and national service. Speakers included David Bernhardt, Deputy Secretary, U.S. Department of the Interior; Dan Smith, Acting Director, National Park Service; Barbara Stewart, CEO, Corporation for National and Community Service; Leslie Weldon, Deputy Director of the National Forest System, U.S. Department of Agriculture; Alexcy Romero, Superintendent of the George Washington Memorial Parkway, National Park Service; and Mary Ellen Sprenkel, President and CEO, The Corps Network. The 2018 Great Outdoors Day of Service was sponsored by the U.S. Forest Service, Guest Services, Inc., and the Maryland-National Capital Park and Planning Commission. Staff of the George Washington Memorial Parkway and Outdoor Recreation Roundtable helped The Corps Network coordinate the event. Young adults, veterans, and staff from the following national service programs participated in the service project: AmeriCorps NCCC (Southern Region); Civic Works (MD); Delaware State Parks Veterans Conservation Corps (DE); Harpers Ferry Job Corps (WV); Maryland Conservation Corps (MD); New Jersey Youth Corps of Phillipsburg (NJ); PowerCorpsPHL (PA); the Student Conservation Association; and Virginia Service and Conservation Corps (VA). Other volunteers included staff and affiliates of the following organizations: CBRE, Corporation for National and Community Service, DowntownDC, National Parks Conservation Association, National Park Foundation, Sierra Club – Maryland Chapter, and Voices for National Service. The Day of Service came at the end of Outdoor Stewardship Week (#ServeOutdoors), a national social media campaign to celebrate stewards of our public lands and raise awareness about service and volunteerism in the great outdoors. Those interested in learning more about ways to #ServeOutdoors can visit https://www.greatoutdoorsmonth.org/stewardship.